Literally for the last couple of years now the Damselfly has wanted to visit Redberry Farm in George on the Garden Route. We just never had the opportunity to be in the area long enough to do so until we spent a long weekend in the town recently. 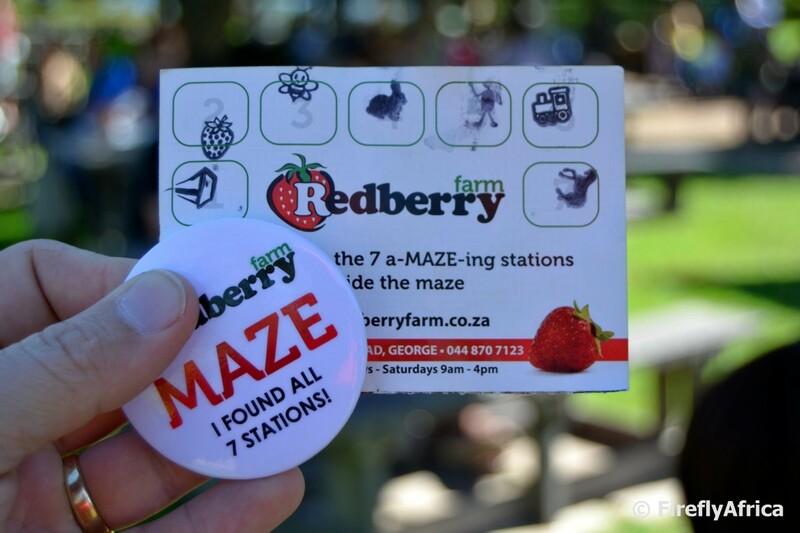 It meant that Redberry Farm was at the top of our "To Do" list for the weekend. The reason for us wanting to visit Redberry Farm wasn't to actually go and pick strawberries (it was cheaper to buy them in their shop anyway), but rather to go and experience the Redberry Maze. I had seen one or two photos of the maze so I knew it was a proper maze, but hell's bells, it was so much more than what I expected. It was a proper dinkum right out of the movies and fairy tales maze. 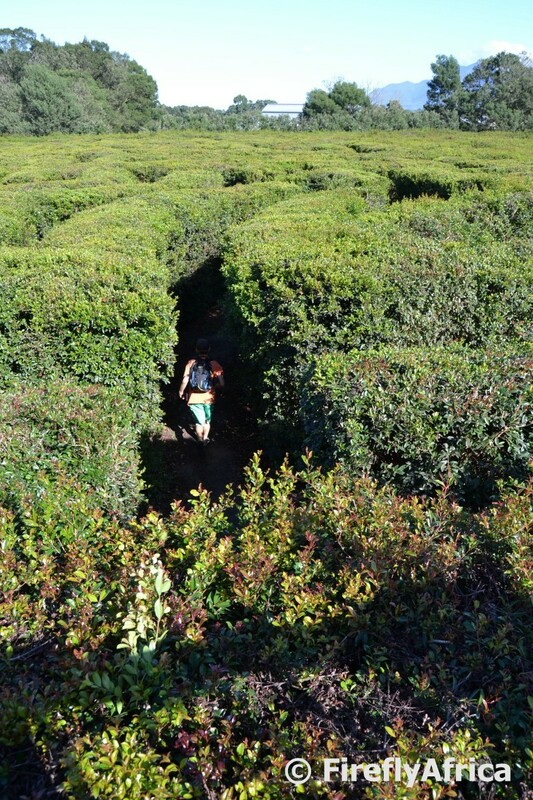 The maze has about 10 000 meters (yes, that is 10 kilometers) of pathways and is grown from over 30,000 Syzygium Paniculatum plants. The object of the maze isn't to go in one entrance and find your way to the exit. No, it's a lot more complicated than that. Each person who enters is given a stamp card and you then have to go and find the seven stations that will each give you a different stamp to put on the card. The map you get is very small so not that easy to follow, which is cool because otherwise it would be too easy, and it only pinpoints two of the stations so you have to search for the rest. Not that finding the two was easy either. I gave the Family a choice to either go in as a group or individually for us to see who can get out first. The Damselfly and Drama Princess decided to stick with me while Chaos Boy wanted to fly solo. He was off like a bolt while we took the more systematic slower approach. The maze is really amazing (excuse the pun). The hedges are between three and four meters high and where it's not totally impenetrable they have inserted wire to make sure nobody cheats their way out. Plus the guardians will keep an eye to make sure you don't try. Just don't get a fright when you come around a corner and encounter a big metal spider, scarecrow or some other maze creature. 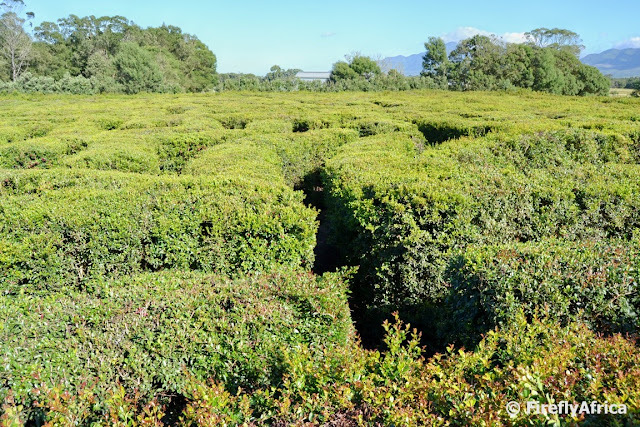 If you are going into the maze, do go prepared and take some water and a hat... perhaps some padkos... and a sleeping bag and tent... Oh and make sure you do your toilet stop before you enter because you never know how long it's going to be before you get out again. I am proud to say that an hour and a half after entering the maze I led my little group out again with all seven stamps, collecting our prize badges at the exit. We met some friends from George for some coffee / milkshakes / strawberry juice in the very popular coffee shop section and waited for Chaos Boy to emerge. And waited... and waited... and waited... An hour later I headed back in to go and rescue him, finding him where he was collecting his last stamp. The boy was exhausted from all the running. Just shows that slow and steady often gets you there quicker. Would I go again? In a heartbeat. I absolutely loved the experience and wouldn't it be great to see this as a roadblock on an Amazing Race? What does it cost? R35 per person. Not bad for an hour and a half worth of entertainment. Just in case you were wondering. We weren't invited to visit, paid our own way and nobody there even knew that I was a travel blogger. 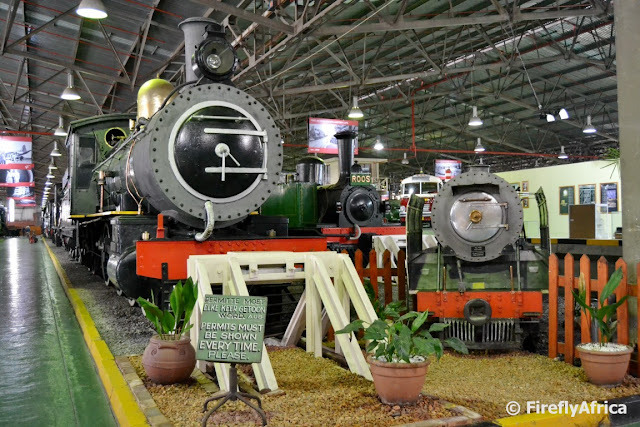 When in George the one attraction you have to visit is the Outenique Transport Museum (also known as the Outenique Railway Museum). 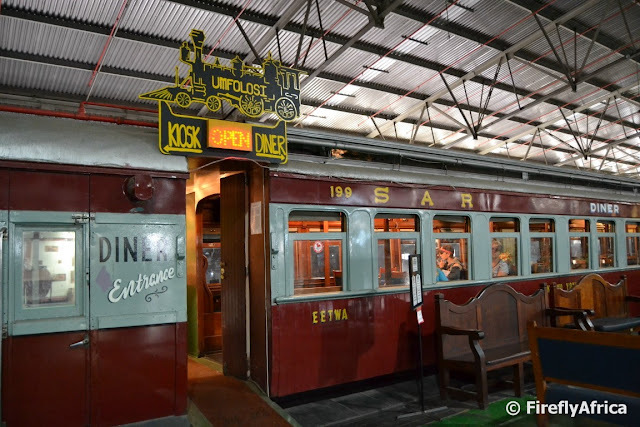 It used to be one of my regular stops on the Garden Route back when I was working as a tourist guide and the Outenique Choo Tjie steam train was still running. Spending a long weekend in George I just had to take the family to show them this amazing place. I was just a little worried, because although I love museums, they might possibly find it slightly boring. I was wrong. The museum has an exceptional collection of railway memorabilia which include 13 steam locomotives and probably twice as many (if not more) different carriages. Some of the pieces that take pride of place in the museum are the Emil Kessler - Johannesburg’s first steam locomotive, the impressive GL Garrett, a coach from the Royal Train of 1947 and Paul Kruger’s coach and private saloons. 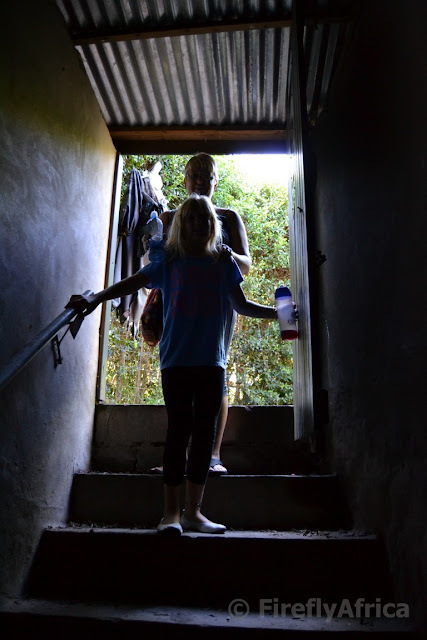 The Damselfly grew up on stations in the Langkloof while her father worked as a station master and she was mesmerised. I could not believe that I was actually waiting for her the whole time as she slowly looked at just about everything in the museum, often calling me back to share some railway related childhood memories with me. One of the things the KidZ loved the most was that they could climb into some of the locomotives and see what it looked like inside. They were all happy which made me happy and not guilty at all fro bringing them to a museum while we were on holiday. One of my highlights of the museum every time I visit is the massive model train layout in one of the rooms. I used to spend way too much time in here while my guests were wandering around and it got me interested in modeling. 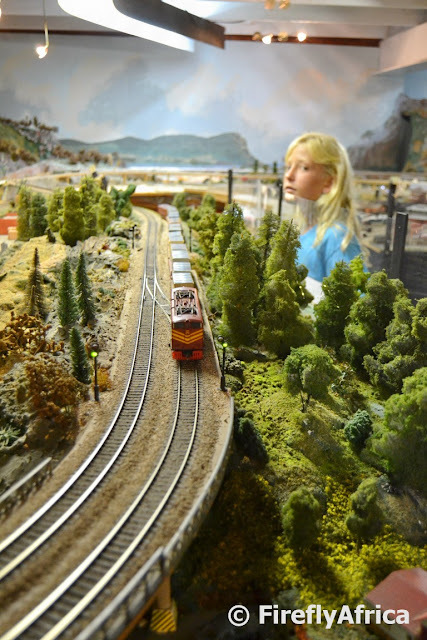 When I say interested in modeling I mean I've actually started building my own landscape model, without a train though. Like farther like son... and daughter. The KidZ nearly got stuck in the model room and I had to dig out coins to make the trains run a couple of times. 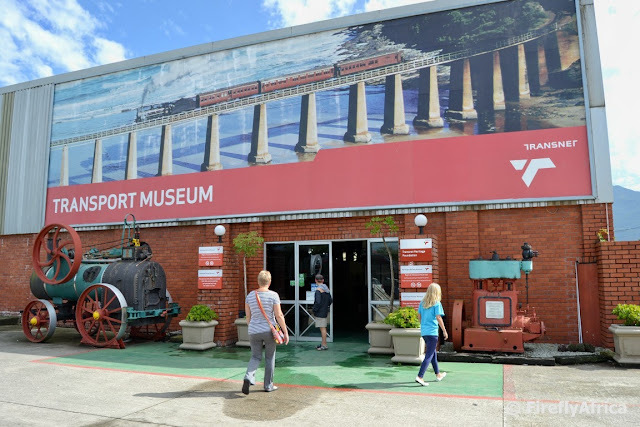 But the museum is a transport museum after all and not only about trains. There is a huge exhibit of privately owned vintage cars, fire fighting vehicles from waaaaay back, a car similar to the one from Ghost Busters (which Chaos Boy immediately spotted) and a horse drawn hearse. 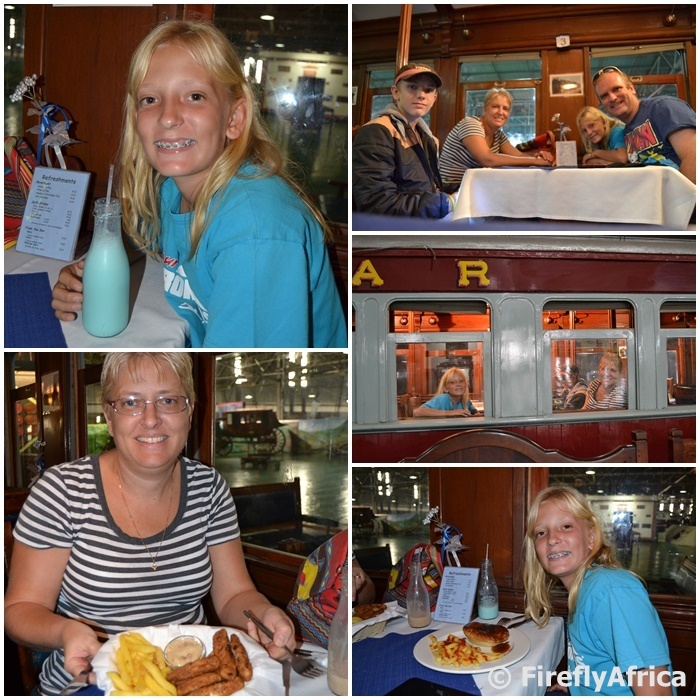 I think one of the biggest highlights of our visit turned out to be the Umfolosi Diner car. Yes, the museum has a little coffee shop dash restaurant in a diner car and there was no way that we were going to pass up the opportunity to have something to eat in it.. So milkshakes, chicken nuggets and pies, chips & gravy it was. All we needed was the sway of the train and the rhythmic katic-katic katic-katic sound of the wheels on the track. So next time you are in George, doesn't matter if you are staying over or just passing through, pinch off an hour or so and head for the Outeniqua Transport Museum. They are open daily (excluding Sundays) from 8am to 5pm in season and Monday to Friday: 08h00 to 16h30, Saturdays and Public Holidays: 08h00 to 14h00 and closed on Sundays out of season. The cost, R20 for adults, R10 for kids under 12 years and under 6 years for mahala at the time of our visit in April 2016. And just in case you were wondering. We weren't invited to visit, paid our own way and nobody there even knew that I was planning to write a post about it. I don't think George is very high on anybody's list of possible holiday destinations. Yes, as part of the Garden Route but not standing on it's own. If that is how you think then I'm going to have to tell you how wrong your thinking is. Spending Easter Weekend in George showed me in four days that George is actually the ideal family destination. Beautiful mountains and passes, a stunning coastline, a laid back town atmosphere and not outrageously expensive attractions. 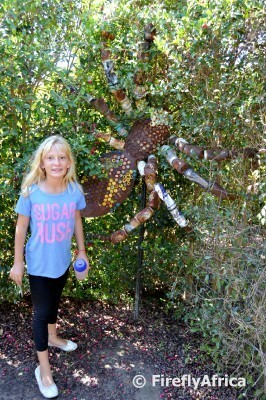 We were camping in George and took it easy while we were there (plus I did a load of Geocaches) so chose one attraction to do every day while there. It turned out that all three are highly recommended and very cheap to do so here are Three things to do in George that are easy on the pocket. 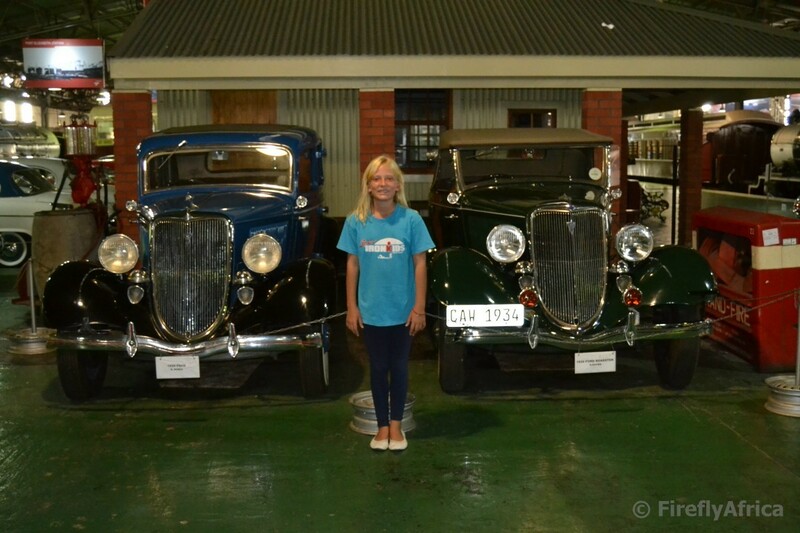 The Outeniqua Transport Museum is a must do while in George and if you do nothing else then you have to try and get here. 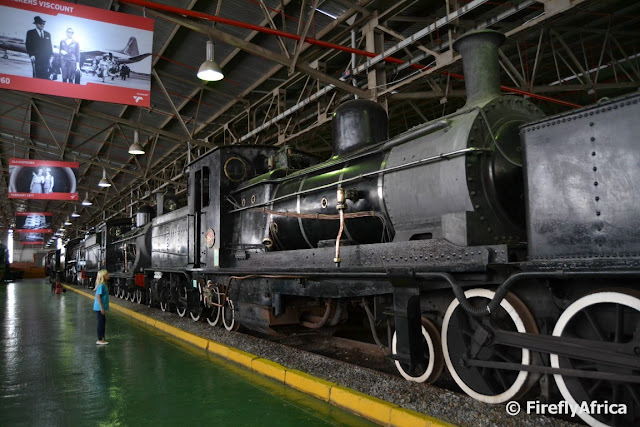 The museum used to be the departure point of the Outeniqua Choo Tjoe and has the most magnificent collection of trains (13 locomotives and numerous carriages), vintage cars and other vehicles, railway memorabilia and the most magnificent model train layout. I thought the family would be totally bored but they were anything but. You can also have lunch or just a coffee and milkshake in a dining car. The best of all, adults pay R20 and kids under 12 only R10. What an absolute bargain. The one thing we really wanted to do while in town was a visit to Red Berry Farm. 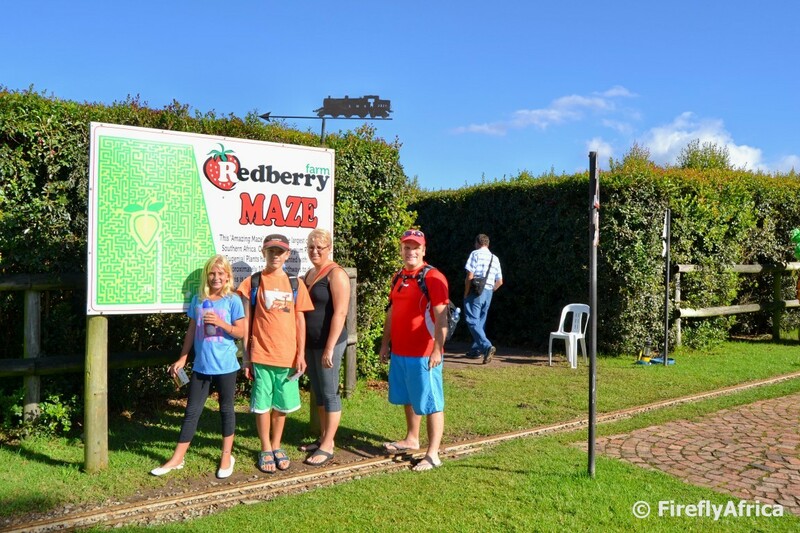 Red Berry Farm offers strawberry picking as well as a host of kiddies activities. 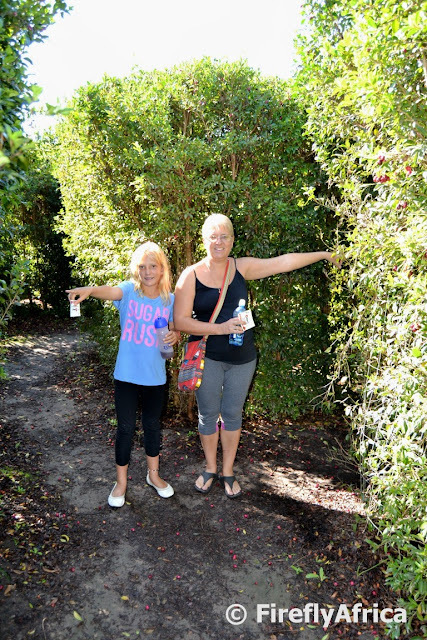 We were there to do the hedge maze. 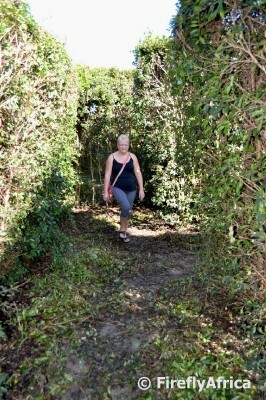 I knew in advance that it was a proper hedge maze but I don't think I was fully prepared for what we encountered. A truly dincum get lost for hours hedge maze. You get a stamp card and have to look for 7 stations along the way to complete the card which took me an hour and a half. After having coffee and a chat with friends who came by to say hi, I went back in an hour later to go and find Chaos Boy who was still wandering around looking for his last two stamps. Would I go and do it again? In a heartbeat. The cost? A paltry R35 per person. On our last full day in George the options we considered were to either go down to Victoria Bay or up the historic Montagu Pass. We opted for the latter of the two and explored this truly scenic pass completed way back in 1848. 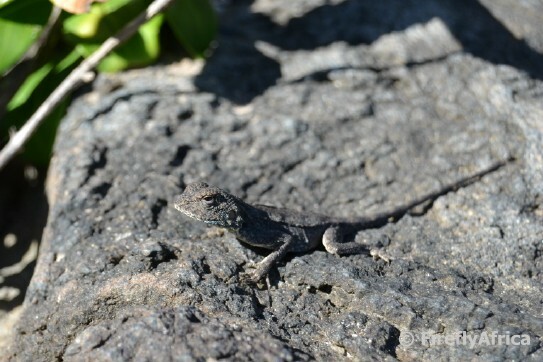 The trip up was a combination of beautiful scenes, historic sites and being close to nature. Although a dirt road that does take a battering from the rain, we drove up to the top and back down without any trouble in the Chev Aveo. So what would you pay for this little outing? Well, nothing more than your petrol and some snacks for along the way. Just don't leave your camera behind. I'm a big advocate of keeping one's eyes open for the little things as much as the big stuff. Spending a night at Kob Inn on the Wild Coast I went for an afternoon stroll down to the Qora River and while the coastline and river held my attention, I still spotted this little scene. The more delicate side of the Wild Coast. 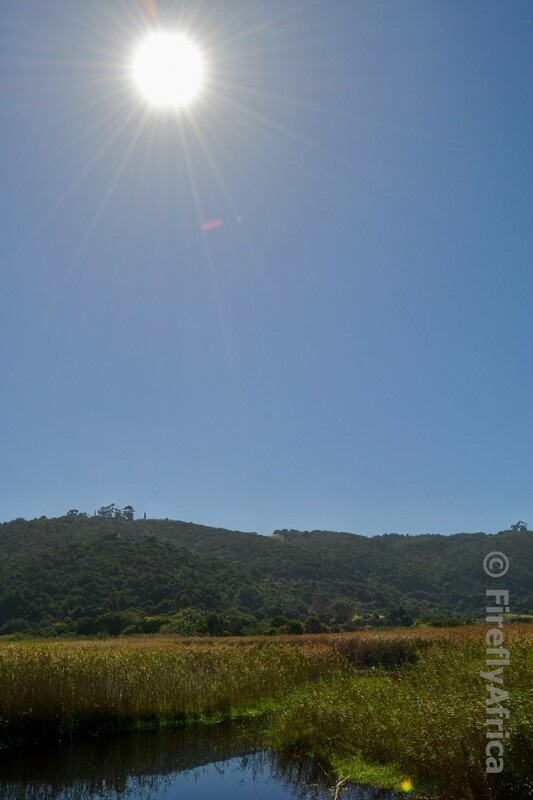 Ahhh, a sunny autumn's day in the Wilderness section of the Garden Route National Park. If you drive through the Langkloof from East to West you enter the valley just past Humansdorp and pass towns like Kareedouw, Jobertina, Krakeel, Louterwater, Misgund, Haarlem and Avontuur. 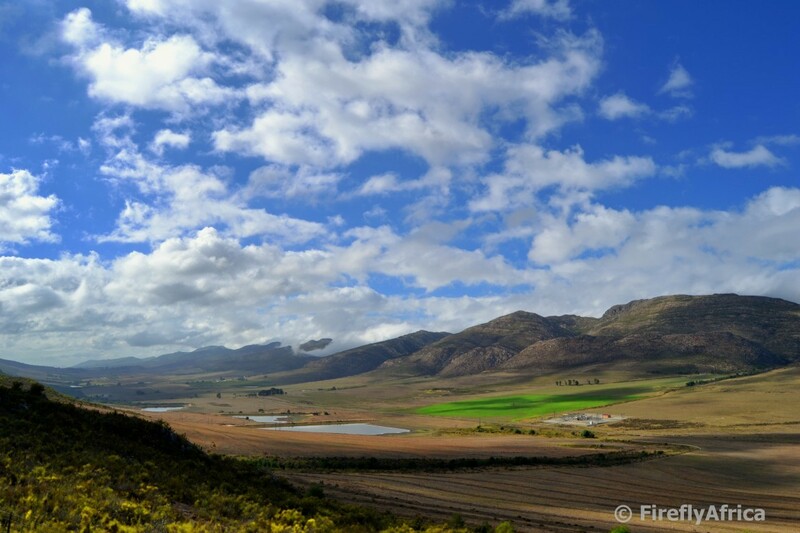 The valley is about 160 km long and the R62 (the road running through the Langkloof) then meets up with the N9 near the town of Uniondale. 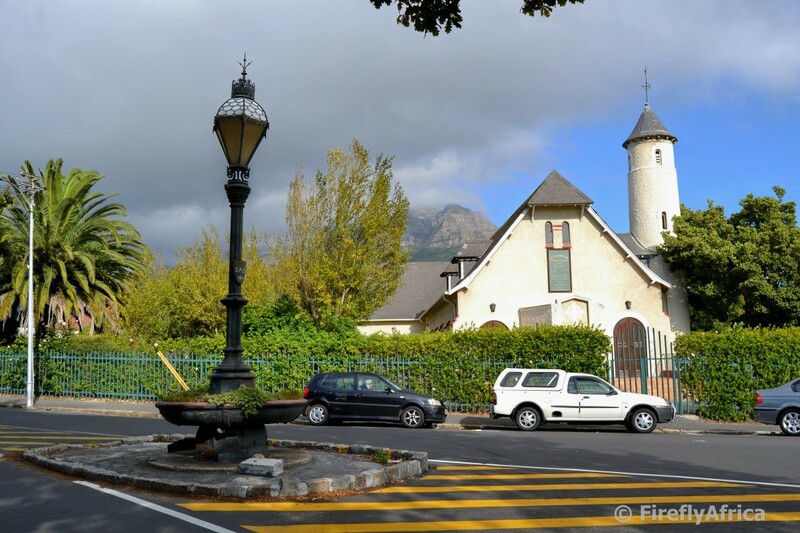 Between this intersection and Uniondale travelers will find the Potjiesberg Pass. The name of the Potjiesberg, directly translated, means little pot and refers to the mountain that resembles a round pepper pot. 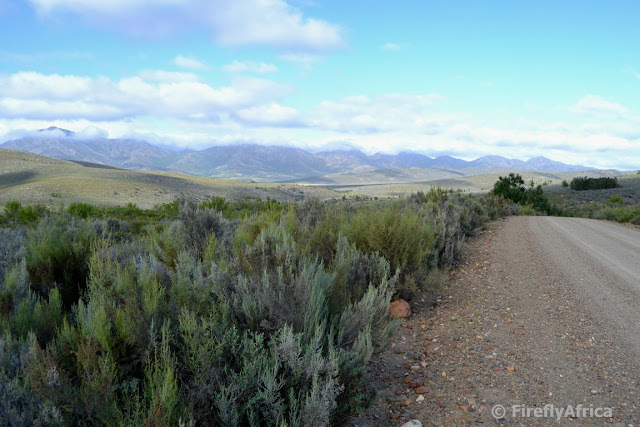 It was on this pass that I stopped to look back towards the Langkloof when I took the picture in this post. On my last trip to Cape Town I connected from Robertson to Grabouw via a back road past Villiersdorp. It was late afternoon and the sun was heading towards the mountain on my right hand side at a speed. 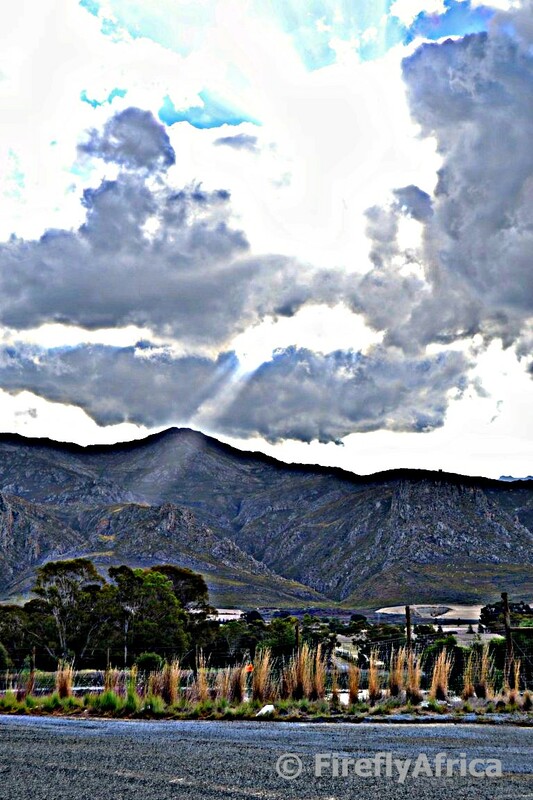 Suddenly it broke through the clouds and a sun ray reached down and touched the mountain side. I pulled over as quickly as I could to grab a photo. It looked much better in real life than it did in the photo, hence the HDR enhancement, but I really wanted to share it with you. I often wonder if people really realise how many historic places and objects there are around our cities and towns. I'm not only referring to the big and well known historic attractions but rather to smaller ones many people probably drive past without even a second look. 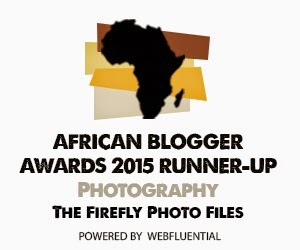 One of these I discovered in the Cape Town suburb of Mowbray while on my way to a meeting. I was following my GPS to a Geocache that was on my way and it took me to this historic water fountain with trough on a traffic island. This fountain was manufactured by Walter Macfarlane & Co of Glasgow and presented to Mowbray by the SPCA in 1899. These days the fountain is no more and the trough has a little garden in it. 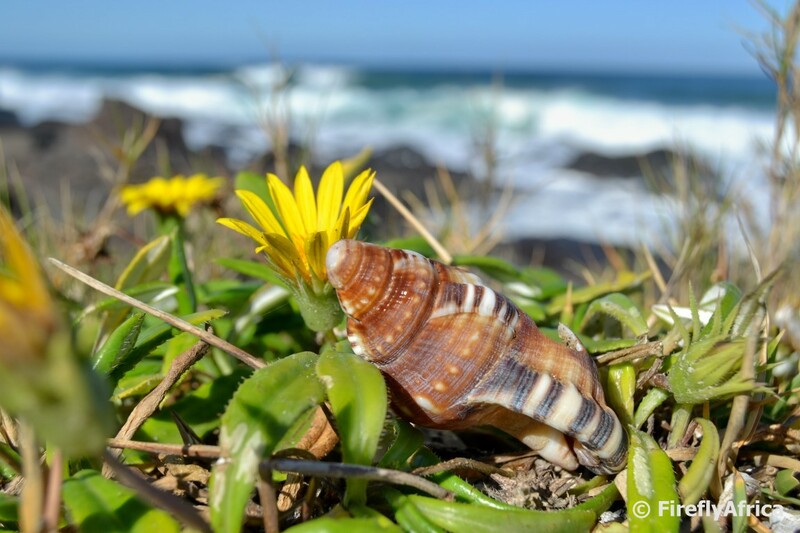 Most tourists and holiday makers traveling from the Western Cape to the Eastern Cape (or vice versa) do so along the world famous Garden Route. 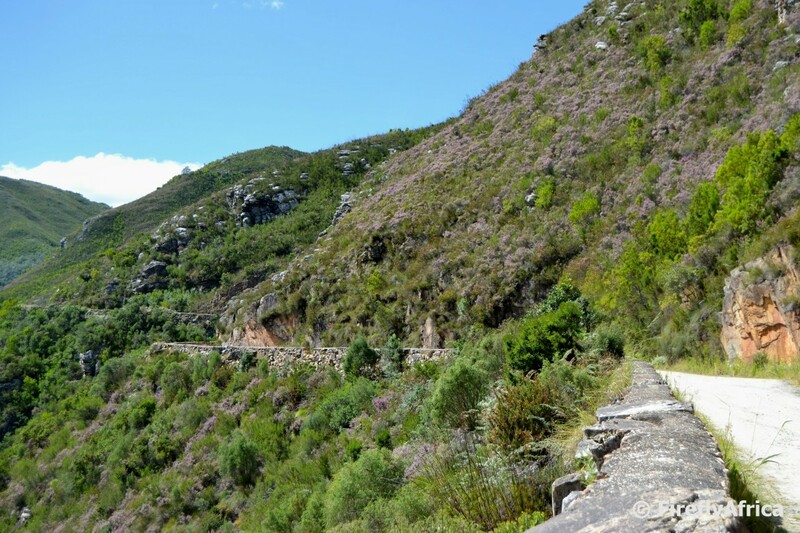 It means that they miss out on the very scenic Route 62 through the Langkloof which runs parallel to the Garden Route on the other side of the mountain. You could say traveling through the Langkloof is travelling off the beaten track. On my last trip up the Langkloof I detoured off onto a dirt road in the Bo-Kouga to, yes you guessed it, find a Geocache. You could say I went off the off the beaten track. I found the cache as well as this stunning view.